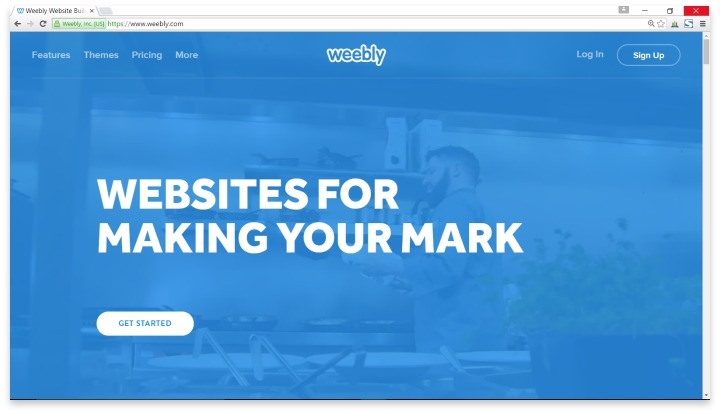 Since 2007, Weebly has been helping first-time business owners create affordable websites that are built to help you grow your business. That’s truly the aim of Weebly: the start-up business owner. Their website building platform is filled with the types of features that modern indie businesses need to connect to and serve their clients around the world. They boast over 250 million views spread across their 30 million websites every month. What sets Weebly apart is threefold: first, their service is completely uncluttered and simple to use. You don’t have to know a thing about website building in order to create a customized site that looks like it was built by a professional designer. Second, Weebly has a built-in app store that allows you to add elements to your website until you get the perfect site. Need a newsletter? That’s there. Want to sell items directly from your page? You got it. Need a donation counter, a project countdown, or a calendar of events? What about a forum on your website for your clients to gather and chat? All of these features, plus many, many more are available. Finally, Weebly can be fully accessed via iPad or Android app, so you can create or modify a website from your mobile device. Clearly, Weebly offers a great set of features that create excellent websites for your business. One of the key pros of Weebly is their free version. This is perfect if you need a temporary website, or if you want to experiment with website outreach before you commit your money and time to an online storefront. You can easily update to their affordable monthly or yearly plans at any time. Their attractive templates, easy interface, and built-in analytics tools make it simple for you to control every aspect of your online presence. You don’t need to know anything more than how to type and drag n’ drop. You can also create a custom mobile site that makes your business look just as great on phones and tablets as it does on computer browsers. Weebly helps start-up business owners create affordable websites that are built to help you grow your business. Overall, Weebly is a great option, especially for start up businesses that want to dip a toe in the waters of online selling before committing. If you want a good mixture of classy styling without the overly frilly designs, and useable features that make sense for your business goals, Weebly is quite possibly one of the best website building services out there. If you’re wanting a content rich blog with tons of interactive features, you may be better served elsewhere, but keep in mind that Weebly offers the ability to add chat and forum features to your site that may replace a blog altogether. Have you had an experience with this company? Please share your Weebly Reviews below.